Ryazansky and Yurchikhin can be seen hurling a pair of Tanyusha nanosatellites, as well as a round Sputnik-like TS530-Zerkalo that will be taking measurements in low Earth orbit, just out of the way of the space station. All the while you can follow the flight of the ISS, with beautiful blue oceans and impressive land masses opening up all around. The Tanyusha satellites were created by students from the Russian city of Kursk, with the help of scientists and the leading spacecraft producer Energia. The Tomsk-TPU 120 satellite from the Siberian city of Tomsk was also launched that day. Amateur radio fans can now tune in to listen to Tomsk and Tanyusha satellites broadcasting multilingual messages at the frequencies of 437.025 MHz and 437.05 MHz. 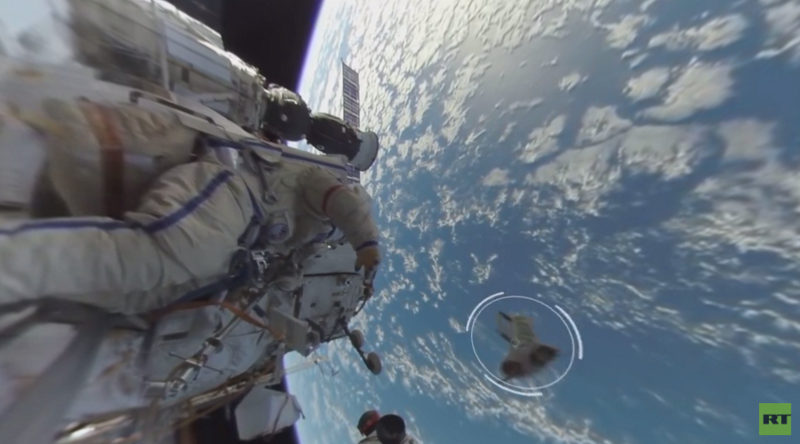 RT’s awe-inspiring video was produced in collaboration with the Russian space agency and RSC Energia. It premiered on Tuesday during a special event at a VR theater at Moscow’s Museum of Cosmonautics. The event commemorated the 1957 launch of Sputnik-1, the first artificial satellite of Earth. The video is the latest addition to RT’s panoramic collection, which includes over 130 videos made since 2015.